What are the benefits of deeper shoes? Have you ever taken off your shoe and noticed a red mark where your feet have been squeezed? If your footwear is feeling tight and uncomfortable, then perhaps you could benefit from wearing extra deep shoes. Shoes with extra depth are basically deeper and roomier than standard fitting shoes. The added depth allows your foot to go in much deeper than it would a standard shoe. Having this extra room is necessary if you suffer with conditions such as swollen feet, bunions or hammer toes. If you have diabetes, it’s important that you have enough room in your shoes as squeezing them into ill-fitting footwear can damage vulnerable feet. Extra depth in shoes also allows you to insert a customised orthotic. Some footwear is specially designed to have a removable footbed which creates extra depth and allows you to use your own orthotic. 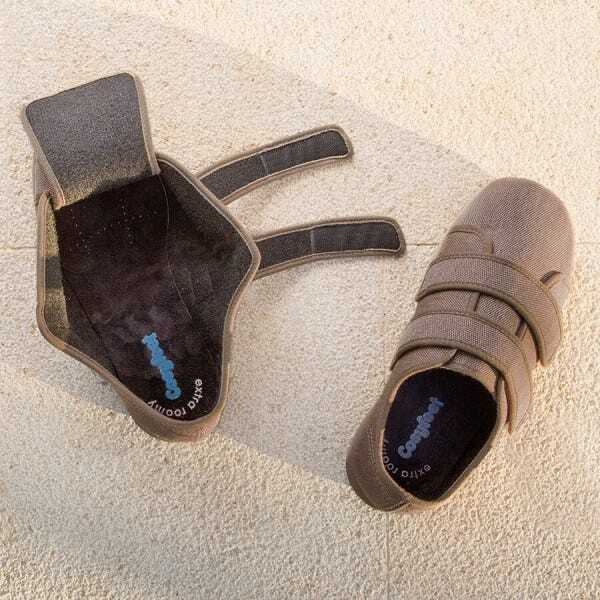 Every style in the Cosyfeet range of footwear has extra depth and many of their styles have removable footbeds.